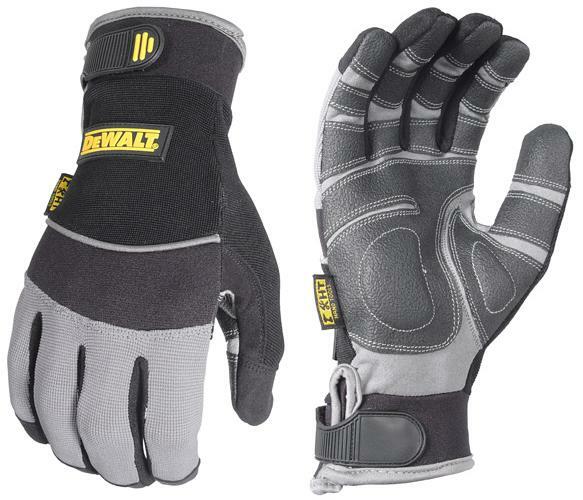 DeWalt DPG210 Gloves PVC Padded Palm are form fitting, medium dexterity, abrasion resistant gloves with anatomically positioned reinforced PVC palm overlays and memory foam that provide versatility and impact protection. Water and oil resistant reinforced PVC palm overlay provides superior non-slip grip and durability. 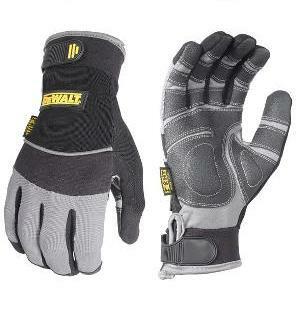 Memory foam palm padding reduces stressful vibrations, increasing power tool control and the stretch nylon gusset provides extra debris protection. Extended UlnaLock TPR wrist closure for snug, secure fit. Reinforced saddle overlay and finger guards provide extreme durablity. Uses: Power Tools, Carpentry, Hand Tools, etc. Abrasion resistant and machine washable. Size Medium, Large and X-Large.